In cryptocurrency, your accounts are only as safe as your keys, and if they’re on your computer, you’re just one hack away from a theft. This is why everyone recommends you use a hardware wallet, since it’s one of the most secure ways to keep your funds safe. However, that level of security comes with a price: it’s a bit impractical to move your funds in & out every time you need to use a ÐApp, exchange, or participate in an ICO. You need to wait for those extra transactions to be confirmed and also pay the extra network fees. This new feature took us some time because we wanted to get this right from scratch. This required a really big code refactor so that we could easily integrate different key signing strategies which our very own Dan Finlay handled like a pro! Check your account balance (ETH or Tokens). Sign transactions — For ex. Send ETH and ERC20 tokens and collectibles, deploy contracts, etc. Your private keys ALWAYS stay in your TREZOR Hardware wallet. Last but not least, there’s another point that’s worth mentioning… you might have seen that some ÐApps let you to use your hardware wallets directly, (and that’s great!) but that only works if the ÐApp developer spent the extra time implementing the integration. By adding hardware wallet support inside MetaMask, we are allowing every single ÐApp that works with MetaMask to be used securely with a Hardware Wallet. We hope that this kind of feature will increase the confidence and security in the entire Ethereum ÐApp ecosystem. 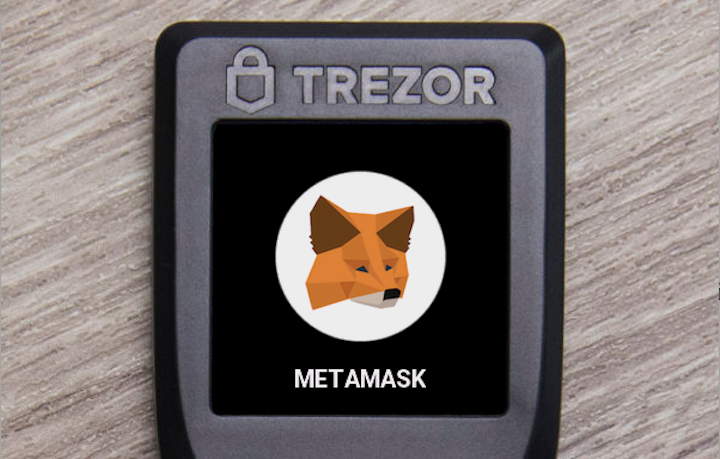 Once you connect any Ethereum account from your TREZOR device, MetaMask will treat that account just like any other account, with the only difference being that every time you need to sign a transaction, you’ll need to connect your TREZOR device and MetaMask will send a request to it to sign that specific transaction. Signing happens 100% inside your TREZOR device and your private keys are never exposed. Another cool thing is that you don’t need to keep your TREZOR device connected all the time in order to see your different accounts and balances, but of course you can also opt to disconnect your device from MetaMask and link it again the next time you need to use it. Click on your account icon at the top right and you will see a new item “Connect Hardware Wallet”. Plug in your TREZOR device to your computer and click “Connect To TREZOR”. You will get a popup from TREZOR asking you for permission to export the public key, and once you confirm, you will see the list of Ethereum accounts from your TREZOR device in the MetaMask extension. 4. Finally, select the account you want to use, and click “UNLOCK”. That’s it! We’ve also added the ability to remove imported accounts, so if you want to stop seeing any that you imported into MetaMask, you can remove it like this. We’re looking forward to adding Ledger hardware wallet support and we’re currently exploring the different approaches we could take since both Ledger and TREZOR offer different ways to integrate with third-party applications like MetaMask. We hope you enjoy this feature, and if you have any feedback please leave us a comment! Thanks to Kevin Serrano and Dan Finlay.